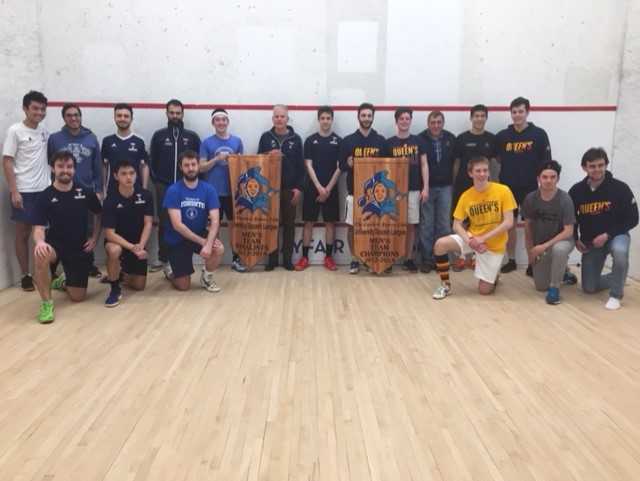 If you haven’t yet experienced the incredible environment at a Jesters University League event, the energy is electric, the level and depth of play impressive and the team spirit and camaraderie indicative of the special squash community we have in Ontario. 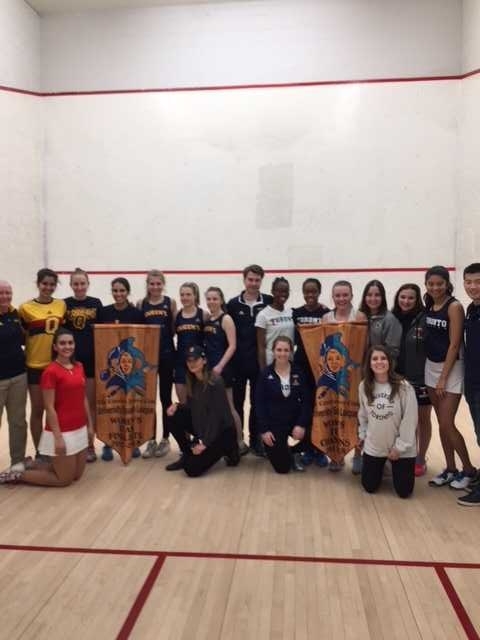 Teams are comprised of former Squash Ontario junior stars, international students choosing Ontario as their place to study and compete and an array of brand new players with raw athleticism who typically experience playing other sports at a high level. This past Saturday, 16 squads descended on Mayfair Lakeshore in the culmination of the Jesters University League’s most competitive season yet. 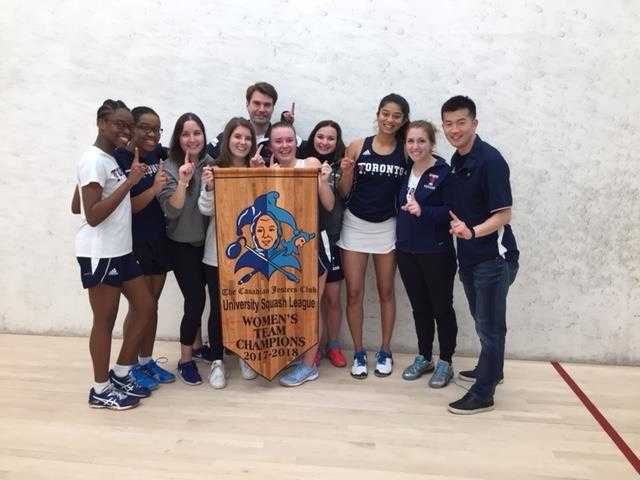 Our Division 1 finals were hotly contested on both the men’s and women’s sides with upset champions Queen's men and University of Toronto women shocking the league. On the women’s side, Josh Ginou’s U of T Varsity Blues women had their full roster in place, including the dangerous Myers sisters (Thandi and Deiria) from St. Vincent lurking at the #5 and #6 spots and superstars Evelyn Moorhouse, Rhea Dhar and veteran Juana Chaves at the top of the line-up to go up against Lisa Coates' juggernaut and 3 time defending champions Queens Golden Gaels. With matches tied at 2-2, Thandi Myers wins an epic 5-gamer to turn the momentum and Coach Ginou’s team pulls off the Philadelphia Eagles-like upset to prevail 5-2 and win the title, with 4 of the 7 matches going the full 5 games. 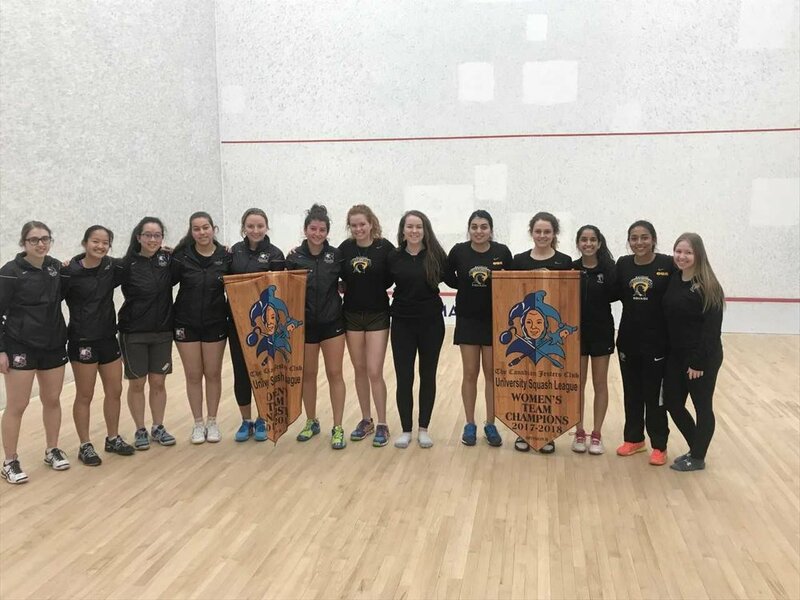 Holly Delavigne’s Western University Mustangs place 3rd, Matt Easingwood’s Brock Badgers place 4th and Vinit Kudva and Clive Porter’s Waterloo Warriors captured the Division 2 title. On the Men’s sides, it was an epic day on the courts as both semifinals went the distance and ended in upset fashion coming down to the final matches ending 4-3. #1 seeds McMaster lead by all-time great Patrick Morkus were shocked by an in-form Queen's team, coached by Jesters League legend Eugene Zaremba who had his team focused, organized and up for a fight. On the other side, 3-time defending champions UWO Mustangs lead by a very busy head coach Derek Moore (who has his Stangs back to #10 in the NCAA) went up against the buzz saw of John Lennard’s U of T Varsity Blues led by rookie sensation Sam Burley and veteran Alex Garceau at the top of the line-up. 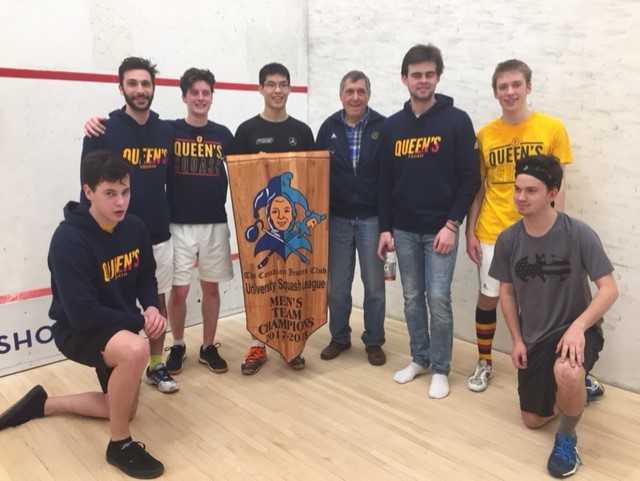 After 3 hours of total play and 5 of the 7 matches going the distance, David had slayed Goliath to set up the Cinderella final of #4 Queens vs. #3 U of T. Down 3-2, with 2 matches to finish and both coaches Lennard and Zaremba admittedly “very nervous”, captain Cameron Butler gets a Queen's win at #2 to even the score, and all eyes focus on the #5 match being played on a back court with the championship in the balance. With Spencer Lee of Queen's up 2-1 and 7-3, he begins to feel the pressure and the U of T player Nicholas De Sousa scraps his way back to 9-9 and a 5th game looks imminent before Lee plays two inch-perfect drops to close out the contest and hand Coach Zaremba and Queen's University the 2018 Jesters League Title. 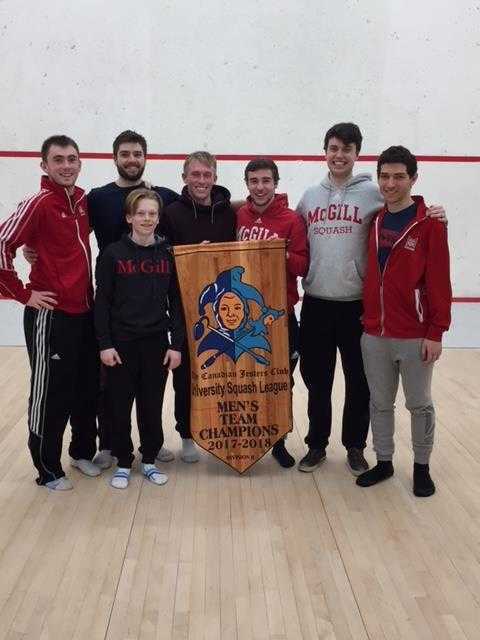 Almost simultaneously, MAC wins the bronze medal match 4-3 over UWO and McGill defeats Waterloo 4-3 in the Division 2 final in a perfect culmination of the best Jesters University League season yet! 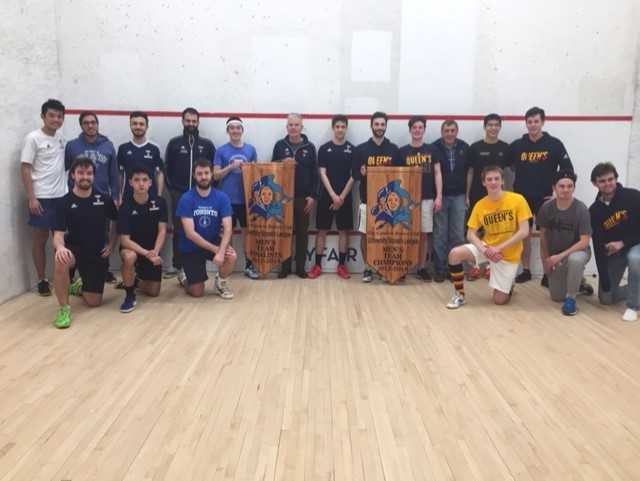 Thanks to the Jesters for continuing to provide University students this wonderful outlet to continue their squash careers, Bert Keene, Ontario Jester’s President for his continued leadership and vision, Alex Carter, Ryan Forster and Iain Crozier as the Jesters University League Committee, Jamie Nicholls from Squash Ontario for his energy and enthusiasm, all of the coaches and volunteers who do this for the love of the sport and Mayfair Lakeshore as fabulous hosts for the days.